The i386-Engine (IE) is a 32-bit microprocessor core module based on the 33 MHz Intel386EX™. It is designed for embedded systems that require high performance, PC-compatibility, compactness, low power consumption, and high reliability at a low cost. The i386-Engine is not only easy to program in C/C++, but also offers PC-compatibility, and thus a vast software library. Whether you use it as the processor core component of an OEM product, as part of a smart sensor, or as a node in a distributed microprocessor system, building your product around the i386-Engine will reduce development time and costs, minimize technical risks, and allow you to deliver a more reliable end product. A larger version of the 5E called the 586-Engine-P (5P) is now available. The 5P integrates a variety of features that makes it a more powerful, stand-alone product. It has its own onboard RS232 drivers and voltage regulators, allowing it to be deployed totally independent of any motherboard support. The 5P also features a new, ultra-high speed 4 ch. 1 MHz 16-bit ADC. The FPU provides arithmetic instructions to handle numeric data and transcendental functions for sine, tangent, logarithms, etc, making this controller useful for intensive computational applications. It is estimated to be 10-50 times faster than software-emulate on an 8/16-bit controller without a FPU. The 586-Engine supports up to 15 external interrupts. There are a total of seven timers, including one programmable interval timer (PIT) that provides three 16-bit PIT timers and three 16-bit GP timers, plus a software timer. These timers can support timing or counting external events. The software timer provides a very efficient hardware time base with microsecond resolution. A real-time clock (RTC) provides time-of-day, 100-year calendar and 114 bytes of battery backed RAM. Two industrial-standard 16550-compatible UARTs support baud rates up to 1.152 M baud. One synchronous serial interface (SSI) supports full-duplex bi-directional communication. One additional optional UART (SCC2691) can be installed. The 586-Engine boots from on-board 256K 16-bit ACTF Flash, and supports up to 256K 16-bit battery-backed SRAM. SDRAM and DMA are not supported. 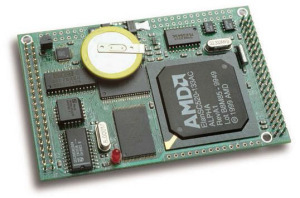 Up to 1GB memory expansion can be added with MemCard-A and PCMCIA ATA Flash cards. There are 32 programmable multifunctional I/O lines (PIO) that can be used as general I/O or other functions. Two supervisor chips monitor 5V and 3.3V and provide power failure detection, watchdog and system reset. The 2.5V is used for the SC520 core and 3.3V for the I/O operation. Signal lines on headers are 3.3V output, and 5V maximum input. All components are soldered on board for highest reliability. The 586-Engine can be powered with a single regulated 5V with the on-board 3.3V and 2.5V regulators. It also can be powered by external regulated 5V, 3.3V, and 2.5V. A total of 19 analog inputs are supported with a serial ADC (TLC2543, 11 inputs, 20KHz sample rate, 12-bit, 0-REF+) and a parallel ADC (AD7852, 8 inputs, 100KHz sample rate, 12-bit, 0-5V). Two serial DACs (LTC1446, 2 channels, 0-4.095V) and a parallel 12-bit DAC (DA7625, 4 channels, 0-2.5V) can be in-stalled to provide a total of 8 analog outputs. The 586-Engine shares a similar pin-out and physical dimensions with the R-Engine, i386-Engine, A-Engine, and a number of other similar ‘Engine’ boards.. As compared to these other engine-based controllers, the 5E offers substantially more computing power at greater per-unit costs and power requirements. The 388 pin BGA package of the SC520 CPU makes repair support for the 586-Engine not available. The i386-Engine-M is an enhanced version of the IE-P with the same mechanical and electrical features. IE-M is an excellent high performance controller for high speed data acquisition and motion control. A single 16-bit SRAM chip replaces three 8-bit SRAM chips used on the IE-P. The 16-bit SRAM with battery backup and the 16-bit FLASH allows the i386EX to operate using the 16-bit data bus for code execution and data access. A 16-bit SRAM of 128KB/256KW must be installed. An optional 12-bit ADC (LTC1415, 1 MHz, 0-4.096V), or 12/14-bit ADC (LTC1409, 800K, +-2.5V), or 16-bit ADC (LTC1605, 100K, 0-4V) can be installed with an analog multiplexer (508 or 509) of 8 single-ended or 4 pair of differential inputs. A high speed 12-bit DAC7625 contains four precision output buffer amplifiers, providing 3us output setting time and outputs of 0 to 2.5V with an external 2.5V reference. The i386-Engine-P is based on the i386-Engine design, and offers an on-board 5-volt regulator and two RS-232 drivers, high-speed ADC, and more on-board memory in addition to standard IE features. The third optional UART SCC2691 can be either RS-232 (default) or RS-485, to be specified when ordering. The i386-Engine-P does not require the VE232. In addition to the 512 KB 8-bit SRAM and 512 KB 8-bit ROM/Flash, the IE-P supports up to 1 MB 16-bit SRAM and 1 MB 16-bit Flash. A 16-bit ADC (LTC1605, 100 kHz, +-10V) or a 12-bit ADC (LTC1415, 1.2 MHz, 0-5V) can be installed. Eight additional TTL outputs are designed for operating an external analog multiplexer. The switching power regulator is useful for lowering power consumption.